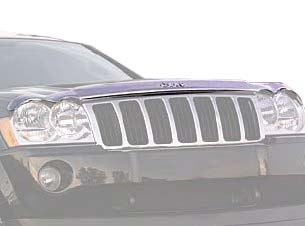 Your Jeep Grand Cherokee will take fewer direct hits from insects and road grit if you fit it with one of these front air deflectors from JustforJeeps.com. This shatter-resistant polymer deflector is molded to fit your WK Grand Cherokee right and look like it belongs there. The wraparound style directs air flow upwards so that less debris, grime and road spray end up on your hood and windshield. Windshield wiper and washer functions are not affected. 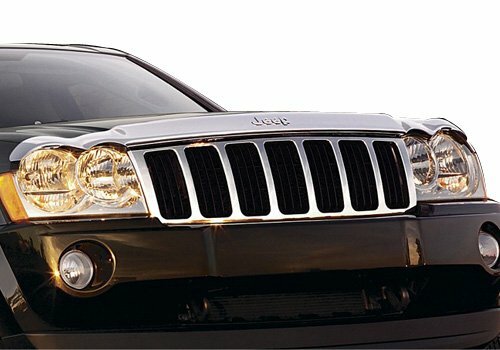 Choose from black tinted or bright, chrome-finish styles, both with the Jeep logo proudly displayed. Wow! very nice. Easy to install within minutes. Makes my 2009 Grand Cherokee appearance stand out. Enjoying it.